Norsafe conducts the highest free-fall drop ever, 61.53 meters (201.9 ft) featuring a so-called free-fall lifeboat. The test came in the wake of another successful drop from a height of 52 metres earlier the same week. Norsafe's groundbreaking new lifeboat, the GES50 MKIII is thus certified for heights up to 47 metres. 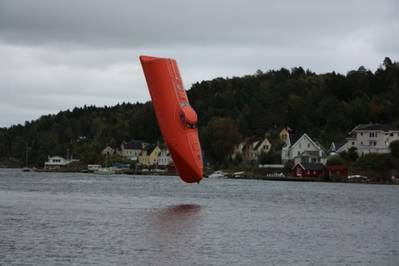 "Norsafe's purpose is not to set records in free-fall drops of lifesaving equipment," says Norsafe AS CEO Geir Skaala. "The essence of our products, however, is to save lives. Quality and trust is the foundation of our existence. It is therefore crucial to us that our customers have the safest and most secure lifesaving equipment available in a situation where another evacuation is not possible." GES50 MKIII builds on cutting-edge technology and meets the DNV-OS-E406 standard for lifesaving equipment on the Norwegian continental shelf. The product is the first model in a series of 3 of Norsafe's newly developed free-fall lifeboats that comply with these regulations. "Despite the fact that the new regulations will not take effect until 2015, it is important for us as the market leader to be ready ahead of time. We are therefore proud to offer the market a new and innovative product that meets the regulations three years prior to them coming into force" added Geir Skaala. GES50 MKIII is 50 feet long, and has a capacity for 70 persons of 100 kg each. Norsafe Group has its headquarters at Tromøy outside Arendal and today counts more than 830 employees. The company has a worldwide involvement that includes production, sales, delivery and service of lifesaving equipment for ships and to the offshore industry.